1) Favorite Cosplay - Wow starting out with a tough one. My favorite at any given moment is usually whichever one I’ve just finished, and does kinda hold true at the moment with Fran. I love that cosplay to death and I love the character and I really really want to find flat silver shoes so I can wear her around at con without my feet feeling like they’re gonna fall off. In the long term though, I have to go with Hestu. It’s such a fun and comfy cosplay, and plenty of people recognize it, and even the ones who don’t usually laugh or smile because I’m wearing a giant broccoli on my head. 2) Least Favorite Cosplay - That’s another hard one because I like pretty much all of my cosplays but it’s probably Roxas. 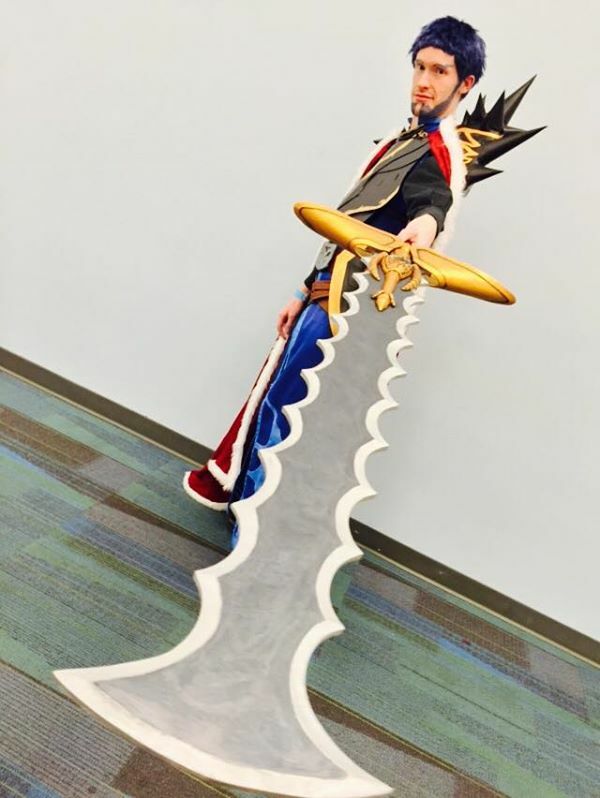 I’m not a huge KH fan, though I have enjoyed playing 1 & 2, and I put a lot of work into the keyblades and the cosplay itself but I was never super happy with how any of it turned out. I was also lazy and didn’t have a wig and by the time I got a wig I wasn’t cosplaying him any more so yeah. 3) Make or Buy - I generally make most of my stuff or alter things I find at the thrift store. But as a general philosophy I think making and buying are both great! There’s a lot of stigma in the cosplay community about buying cosplays but seriously, that’s dumb. We all just want to have fun cosplaying whatever characters we want so why does it matter where the costume comes from? 4) Favorite part of cosplaying - Making a connection with another nerd over whatever nerdy thing we’re sharing. Cosplay is a great way of broadcasting “hey I love this thing that I’m dressed up as” so I always have fun chatting with people at cons who enjoy the character or series I’m cosplaying from. 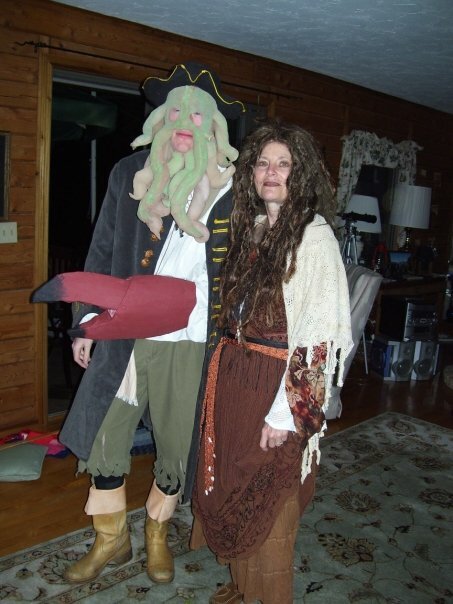 6) Most comfortable cosplay - Banjo-Kazooie. It’s literally some fleece leggings, yellow shorts and a hoodie. I even get to wear slippers with it! 7) Most uncomfortable cosplay - Well the last two new cosplays I’ve done have involved stilettos which make my feet want to die but besides the shoes the cosplays themselves aren’t that unfcomfortable. So I have to go with Thanatos because suspending a bunch of coffins around me was a terrible idea. The whole reason I wore it once and then threw most of it away was because it was horrendously uncomfortable. 8) Best memory in cosplay - Uhhhhhhhhhhhhhhhhhh. Probably meeting all my TWEWY friends for the first time? Also the tiny airbender that was at the ATLA photoshoot the first time I wore Tenzin. 12) Most recent cosplay - Fran from Fate!Apocrypha. You’ve already seen the only real photo I have of her in Q1. 13) Full cosplay or costest - I don’t know what this means exactly but I try on all the pieces as I make them so probably costest? 14) Selfie or shoot - Yes, please. Next question. 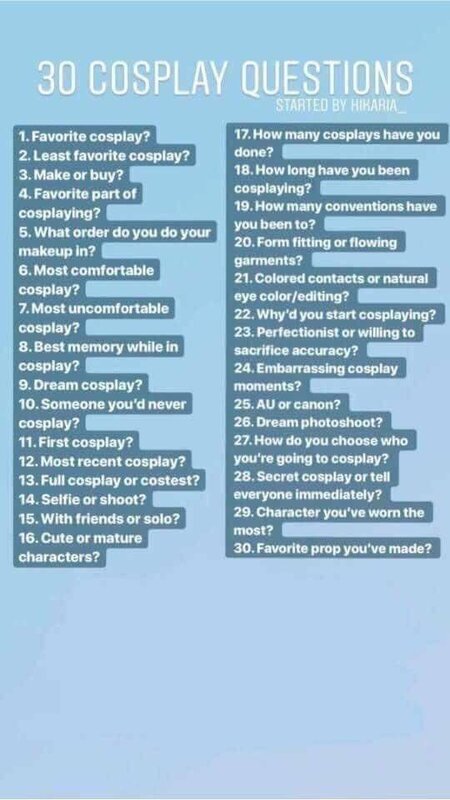 15) Friends or solo - Also both, but I definitely have more fun when I can cosplay with friends. I’ll still solo the random characters none of my friends know anyway. 16) Cute or mature characters - Also both. Sometimes at the same time. 17) How many cosplays have you done - If you include Newt Scamander who I’ve kind of cosplayed but really it was an OC who also loves magical creatures, then I believe the count is up to 46. And you can see all of them (besides Newt) in my Character Compendium. So that makes it 11 years as of Halloween. 19) How many conventions have you been to - I’ve been to maybe 8 or 9 different cons? If we’re counting each individual time I’ve been to a convention I don’t have the patience to sit here and figure that out. 24) Embarrassing cosplay moments - Ripping the entire crotch out of Zelos’s pants. As a bonus I was wearing dark underwear and Zelos wears white pants. You do the math. 25) AU or canon - I’m a fan of both but I usually stick to canon designs.